The YDA always enjoys hearing about news and accomplishments in the lives of former team members. Of late, we've been trying to improve our efforts at keeping abreast of these events. Below are some of the recent highlights of the news that we've heard about YDA alums. If you have any news about former team members that you'd like to share, please e-mail it to the current YDA Development Director so that we can all enjoy their successes. Henry Zhang and Evan Lynyak ('17): Starred in the hit CBS show The Amazing Race! They are both working at McKinsey & Company in NYC. Allison Douglas ('15): Currently a 1L at Yale Law School. Diana Li ('15): Working as an Associate at the Boston Consulting Group (BCG). Nathaniel Rubin ('15): Currently a 1L at Stanford Law School. Zach Bakal ('14): Zach is an equity analyst at Credit Suisse in New York, NY. Michael Barton ('14): Mike is an analyst with Foros, an investment bank in New York, NY. Eric Brooks ('14): Eric is an analyst with Bracebridge, a hedge fund in Boston. Fil Lekkas ('14): Fil is a Fox Fellow at the Free University of Berlin. Sam Ward-Packard ('14): After graduating, Sam worked as the campaign manager for Alex Taubes for State House, in Madison, CT.
Sesenu Woldemariam ('14): Sesenu is working for the Partnership for Inner-City Education in New York City. Joanna Zheng ('14): Joanna is working as an analyst at UBS in New York City. Alyssa Bilinski ('13): Alyssa is pursuing a Marshall Scholarship at the London School of Hygiene and Tropical Medicine and the London School of Economics. Stacey Chen ('13): Stacey is working as an analyst at Redstone Strategy Group near San Francisco. Robert Colonel ('13): Robert is working for hedge fund Bridgewater Associates in Westport, CT.
Andrew Connery ('13): After graduating, Andrew worked as a staffer in the office of Congressman Joe Garcia in Washington, D.C.
Max Dovala ('13): Max is an analyst at Redstone. Aaron Hakim ('13): Aaron is working at a financial and biotech firm in Greenwich, CT.
Ben Kornfeld ('13): Ben is a financial analyst at hedge fund Weiss Asset Management in Boston. Michael Magdzik ('13): Magdzik is working as a consultant at Deloitte & Company near Washington, D.C.
Nate Blevins ('12): Nate is working as a reader and research assistant for Judge David Tatel in Washington, D.C.
Naz El-Khatib ('12): Naz is working as a consultant at McKinsey & Company in NYC. Kate Falkenstein ('12): After graduation, Kate enrolled at Stanford Law. David Trinh ('12): As of 2013, Trinh is working at a hedge fund in Westport, CT.
Arjun Shenoy ('12): Arjun is working as a consultant for Deloitte in Washington, D.C.
Marc Wallach ('12): Marc is working as an analyst at the Sequoia Fund in Chicago. 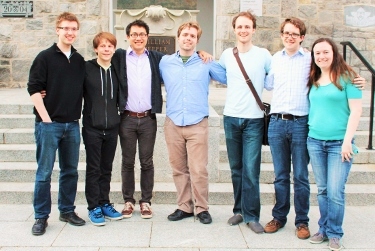 Max Webster ('12): Max is working for Communificiency, a recent start-up. Kristin Briggs ('11): As of 2013, Kristen is working at a hedge fund in Westport, CT.
Grant May ('10): Grant started law school at Columbia in the fall of 2012. Steven Kryger('10): As of 2013, Steven is working at a hedge fund in Westport, CT.
Tess Reed('10): After graduation, Tess accepted a two-year position as a Legal Analyst at Goldman Sachs headquarters in New York City. Habib Moody('10): After graduation, Habib took a position at the Urban Institute in Washington, D.C.
James Luccarelli('10): James is pursuing a doctorate in Chemistry at Oxford; he plans to attend Harvard Medical School upon his return to America. Andrew Rohrbach ('09): Andrew spent last year working in the chambers of Judge David S. Tatel of the D.C. Circuit. He will take a position at Bloomberg News in the fall. Jeff Geels ('09): Jeff is currently working as a consultant for McKinsey and Company in Dallas, TX. Haley Nix ('09): Haley has completed her first year at Yale Law School, where she will continue in the fall. Erin Miller ('09): Erin is now the manager of SCOTUSblog, and will be a 1L at Yale Law School this fall. Josh Bone ('08): Josh spent last year working for the Center for Law and Social Policy and plans to enroll at Yale Law School in the fall. Jason Blau ('08): Jason got married on June 27th to Diana Mosca (ES '08), and continues to work for Redstone Strategy Group in Boulder, CO.
Lauren Hallett ('08): Lauren completed her masters degree at the University of Western Australia in restoration ecology; she will be starting a PhD in environmental science at UC Berkeley in the fall. Ashali Singham ('08): Ashali continues to work at the Center on Budget and Policy Priorities as a Research Assistant. Adam Chilton ('07): Now an Assistant Professor of Law at the University of Chicago. He's married to Britt Cramer, a litigation associate at Kirkland & Ellis. Ian Clowes ('07): Now studying at Columbia Business School and an Engineer Officer in the U.S. Army Reserve. David Denton ('07): Now an Assistant U.S. Attorney in the Eastern district of New York. He is about to marry Corinne Snow, an environmental litigation and regulation associate at Vinson & Elkins. Dylan Gadek ('07): Now at Blueprint LSAT Preparation in Tempe, Arizona. Luke Ortega ('07): Now a Foreign Service Officer at the State Department. Currently posted as an analyst in the Bureau of Intelligence and Research. Matthew Wansley ('07): Now a Climenko Fellow at Harvard Law School. Rory Gillis ('06): Now a litigation associate at Lenczer Slaght in Toronto. Aaron Zelinsky ('06): Now an Assistant U.S. Attorney in Maryland. He is a member of Mueller's team, tasked with investigating Trump's connections with Russia. He is married to fellow YDA alum Monica Mix. Sarah Marberg ('06): Now an associate at Hogan Lovells in Washington, DC. She's married to Nate Pysno, an associate at Buckley Sandler. Josh Johnson ('06): Now an appellate litigator at Vinson & Elkins in DC. Married to Jillian McMahon. Ariel Schneller ('06): Now a staff attorney at Legal Aid Society in NYC. Monica Mix ('06): Now the Associate Program Director of the Med-Peds Urban Medicine residency at Johns Hopkins and a doctor at the East Baltimore Medical Center. She recently (finally!) got engaged to fellow YDA alum Aaron Zelinsky. Josh Bendor ('05): Now a legal fellow at the ACLU of Arizona. He's married to Erin Scharff (a sometimes YDAer, herself), an Associate Professor at ASU's law school, and they have an almost 3 year old son, Philip, and a 10 month old son, Daniel. Mikey Palmieri ('05): Now a litigation associate at Friedman Kaplan in NYC. Andrew Korn ('05): Now a financial consultant at Sageview Capital. He and his girlfriend, former Vassar debater and now Boies Schiller litigation associate, Brooke Alexander, live in Greenwich, CT.
Joseph Ross ('04): Now a data scientist at Ayasdi in Redwood City, CA. He's married to Alli Gilmore, also a data scientist at Ayasdi, and they have a 3 year old son, Elliot. Beth O'Connor ('03): Now an attorney-adviser in the Office of the Legal Adviser at the State Department. She's married to caleb Ward, a Pediatric Emergency Fellow at Children's National Medical Center, and they have an eighteen month old daughter, Alex. Jay Cox ('03): About to become Counsel to the Attorney General. He's married to Melissa Patterson, an attorney in the Civil Appellate Division (with Adam! ), and they hae two daughters, Annie, 5, and Lizzie, 3, as well as a son due in April 2016. Adam Jed ('03): Now an attorney in the Civil Appellate Division of the DOJ. Tim Willenken ('03): Now a Corporate Development Associate at DE Shaw in NYC. Aaron Lemon-Strauss ('03): Now Executive Director of the SAT Program for the College Board. He's married to Sam Trepel ('02), an attorney in the Civil Rights Division of the DOJ, and they have a 3 year old son, Micah, and an 8 month old daughter, Ada. Brian Fletcher ('01): Now an Assistant to the Solicitor General. He's married to Paige Herwig ('02), Counsel to the Attorney General. Scott Luftglass ('01): Now a partner is the Litigation Department of Fried Frank in NYC. He's married to Karen Pape Luftglass and they have a 2.5 year old daughter, Quinn, and a 6 month old son, Clayton. Jake Sullivan ('98): Now is a Senior Fellow in National security and Visiting Lecturer at Yale Law School. Previously, the National Security Adviser to VP Biden. Recently married Maggie Goodlander ('09). Thiru Vignarajah ('98): Now Deputy Attorney General for Maryland in charge of criminal enforcement and consumer protection. He is married to Rakhi Naik, a doctor at Johns Hopkins, and they have a son, Rohan, who is about 6.